The risk of the new types of attack is increasing. Adding of levels of safety protection of structure of organization network is greatly necessary. Protection against attack of network system in type of Distributed Denial-of-Service or DDoS is security service which is developed in order to prevent attack in complete organization network increasingly. 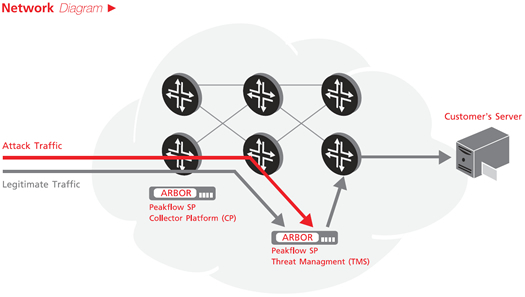 This DDos Protection service can inspect and manage attack from receiving-sending of information with effectiveness, as well as inspection of risk of application and service used in the network of organization safely from attack from hacker, in order for the business operation to be done smoothly and to have efficiency in the highest level. Identify and manage attack against organization network system from correct receiving-sending of information. Inspect structure of organization network and keep safety completely. It can create format in protection according to server group. It can inspect the information inside the application having risk and foreign data running in the organization network. There is no need to buy equipment by oneself. It can be used easily and effectively. Prevent known risky host, by using white and black list. White list is the name list of safe hosts. Black list is the name list of dangerous hosts; data will not be received or sent from these hosts. Protect application in the level of application, by using filter so that camouflaged attack cannot make important service to be damaged. Prevent attack through web, inspecting and reducing attacks through HTTP; this will help control receiving-sending of data in large quantity quickly. Prevent attack against DNS from botnet by inspecting attack on DNS specifically and reduce quantity of running of data. Control attack in large quantity, by using specific mechanism for inspection and it will be sure that suspicious host cannot attack structure of important network. Protect VoiP service which will be attacked from scripts or botnet that will send a lot of request. Customer group having web server or application server. General customers who need protection against Distributed Denial-of-Service Attack or DDoS Protection. Service of DDoS Protection of True Internet can help reduce cost of business organizations and increase safety protection of structure of organization network, because buying equipment by oneself will have high cost and it is not cost-effective for investment, because there will be a lot of consequent expense, for example, there will be preparation of personnel having knowledge in using equipment effectively, maintenance cost, cost of upgrade of system which must be done continuously if the attack format of DDoS is changed. DDoS Protection service helps organizations not to lose time for finding suitable places for installation of equipment by oneself.